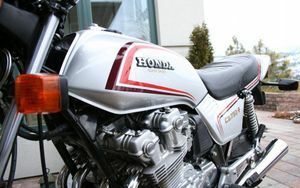 The Honda CB750F is a motorcycle produced by Honda from 1975 to 1982. 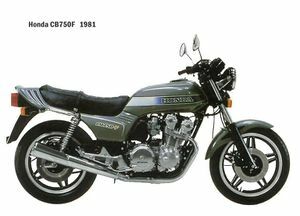 The F Supersport with it’s triple disc brakes, Comstar wheels, more powerful motor, accelerator pump carbs and sleek “sport” styling, creates a whole different persona than the “K” (CB750K) bikes. 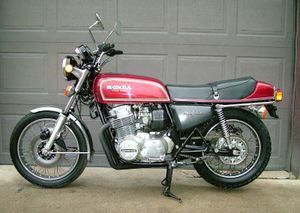 It still retains that “first generation” Japanese four heritage. 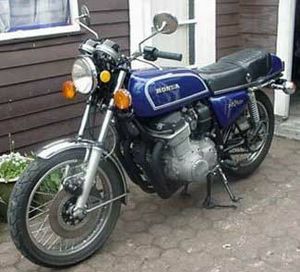 The CB750F0 750 Super Sport was sold in 1975 and was available in one of two colors: Flake Sunrise Orange or Candy Sapphire Blue. 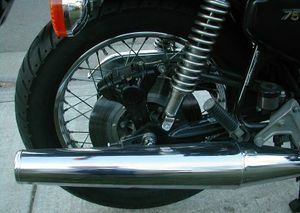 The exhaust was a 4-into-1. 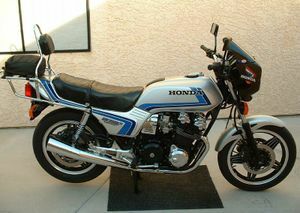 The tank and rear cowl wer the basic color (orange or blue); but the side covers were black. 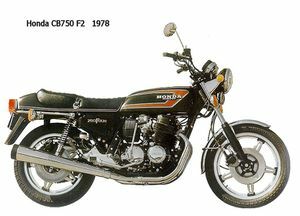 The wheels were wire spoked with a single front disc brake and (unlike the CB750K series) a disc brake on the rear wheel. 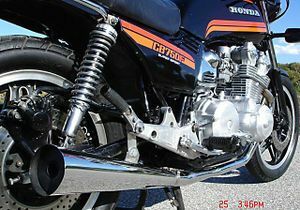 The engine and fork legs were silver. 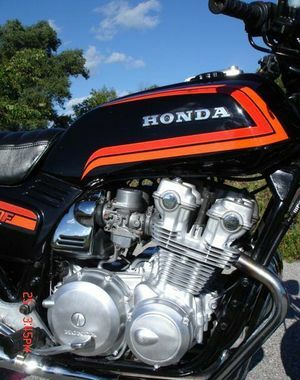 The engine was a 736cc SOHC 2-valve air-cooled inline 4 cylinder linked to a 5-speed transmission and chain drive. 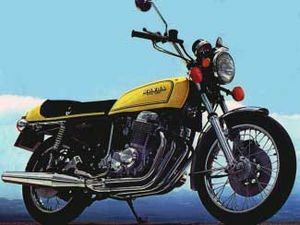 The CB750F'76 750 Super Sport was sold in 1976 and was available in one of two colors: Sulfur Yellow or Candy Antares Red. The instrument faces were bright green. 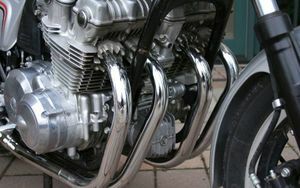 The exhaust was a 4-into-1. 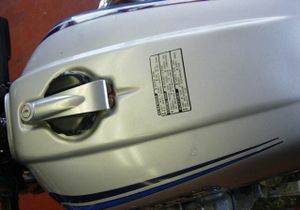 The tank and rear cowl were the basic color (yellow or red); but the side covers were black. 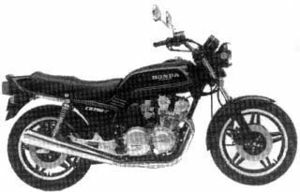 The wheels were wire spoked with a single front disc brake and single rear disc brake. 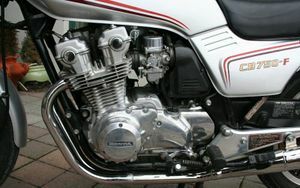 The engine and fork legs were silver. 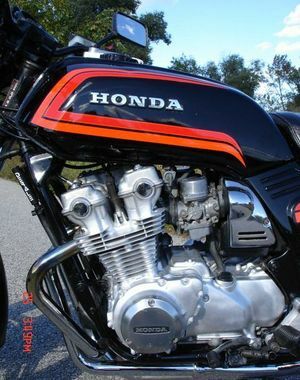 The engine was a 736cc SOHC 2-valve air- cooled inline 4 cylinder linked to a 5-speed transmission and chain drive. 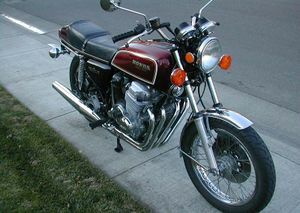 The CB750F'77 750 Super Sport was sold in 1977 and was available in one of two colors: Candy Presto Red or Black. 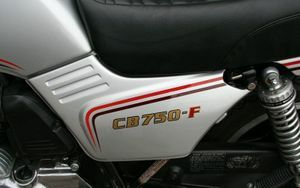 The gas tank stripe was red with gold pinstripes. 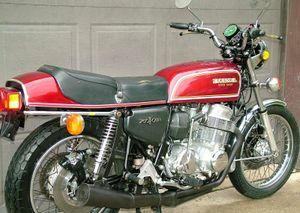 The gas tank, side covers, and rear cowl were the basic color (red or black). 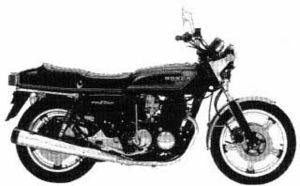 The wheels were comstar with dual front disc brakes and a single rear disc brake. 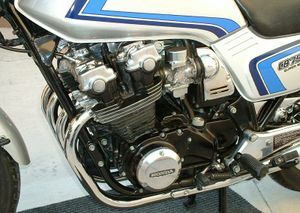 The engine and fork legs were black. 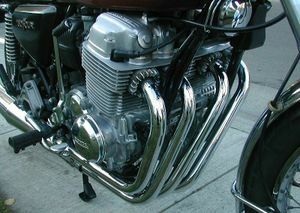 The exhaust was a 4-into-1. 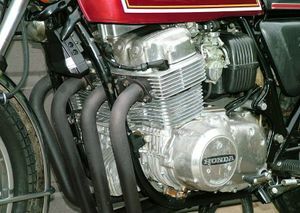 The engine was a 736cc SOHC 2-valve air-cooled inline 4 cylinder linked to a 5-speed transmission and chain drive. 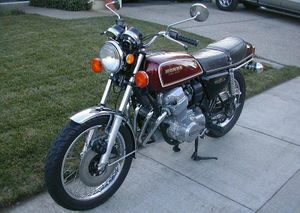 The CB750F'78 750 Super Sport was sold in 1978 and was available in one of two colors: Candy Presto Red or Black. 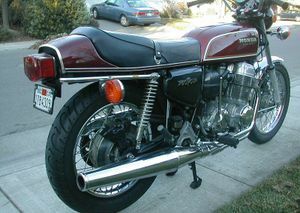 The gas tank stripe was red with gold pinstripes. 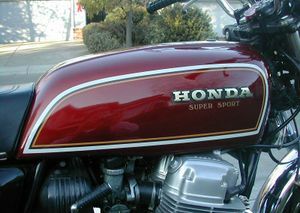 The "750 FOUR" side cover emblem had a new graphic design. 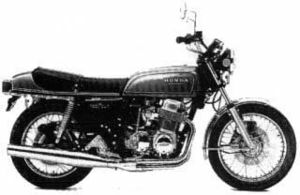 The exhaust was a 4-into-1. 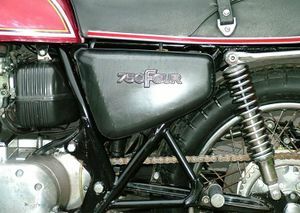 The gas tank, side covers, and rear cowl were the basic color (red or black). 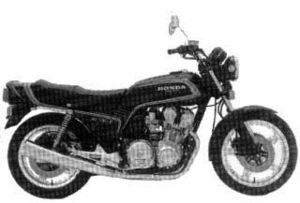 The wheels were comstar with dual front disc brakes and a single rear disc brake. 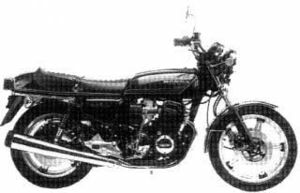 The engine and fork legs were black. 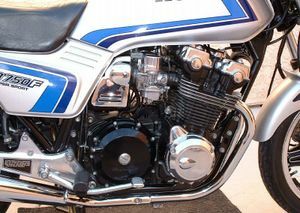 The engine was a 736cc SOHC 2-valve air-cooled inline 4 cylinder linked to a 5-speed transmission and chain drive. 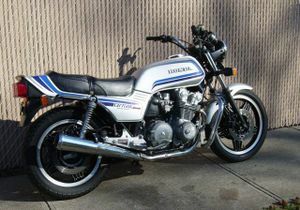 The CB750F'79 750 Super Sport was sold in 1979 and was available in one of two colors: Black or Pleiades Silver Metallic. 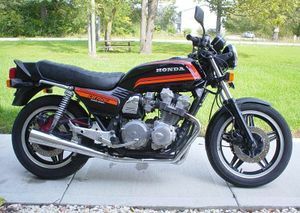 The stripes on the black bike were red and orange; but on the silver bike they were black and red. 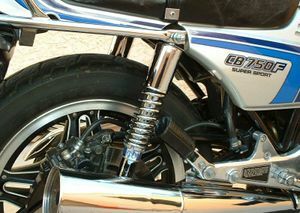 The comstar wheels were silver. 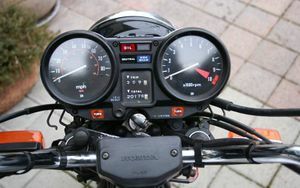 The speedometer had a 150 mph (240 kph) limit. 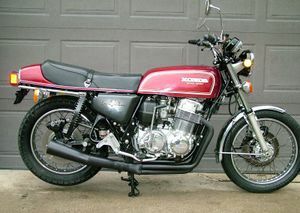 The exhaust was a 4-into-2. 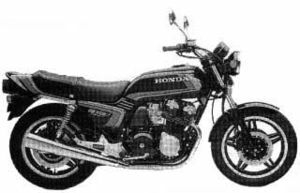 The engine was a 749cc DOHC 4-valve air-cooled inline 4 cylinder linked to a 5-speed transmission. 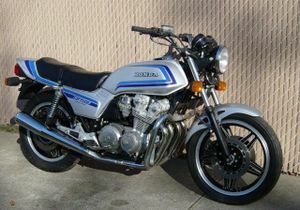 The CB750F'80 750 Super Sport was sold in 1980 and was available in one of two colors: Black or Pleiades Silver Metallic. 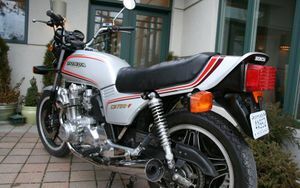 The stripes on the black bike were red; but on the silver bike they were black and red. 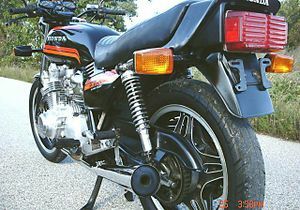 The comstar wheels were black. 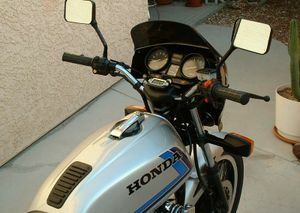 The speedometer had a 85 mph (135 kph) limit. 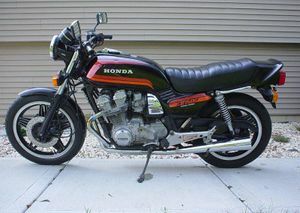 The exhaust was a 4-into-2. 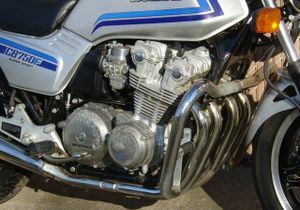 The engine was a 749cc DOHC 4-valve air-cooled inline 4 cylinder linked to a 5-speed transmission. 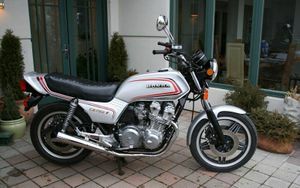 The CB750F'81 750 Super Sport was sold in 1981 and was available in one of two colors: Black or Pleiades Silver Metallic. 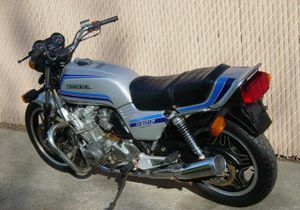 The stripes on the black bike were red; but on the silver bike they were black and blue. 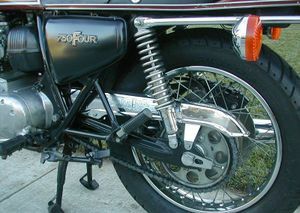 The front disc brakes were slotted with dual piston calipers; the rear had a single disc brake. 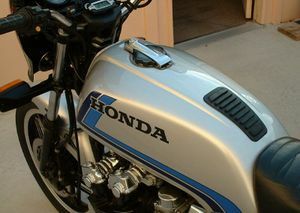 The front fender was redesigned. 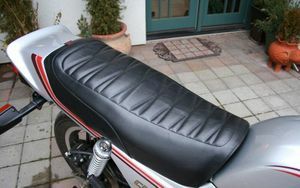 There was a rear spoiler behind the seat. 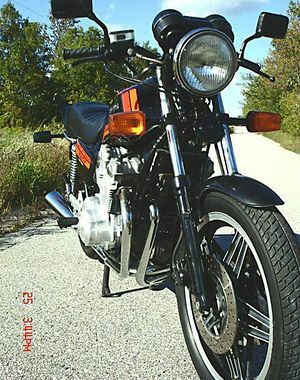 The exhaust was a 4-into-2. 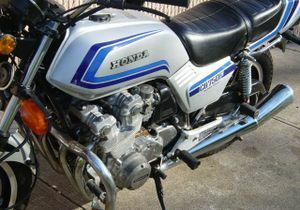 The engine was a 749cc DOHC 4-valve air-cooled inline 4 cylinder linked to a 5-speed transmission. 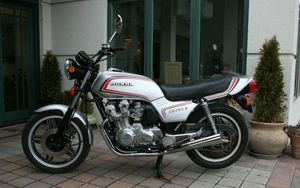 The CB750F'82 750 Super Sport was sold in 1982 and was available in one of two colors: Black or Pleiades Silver Metallic. 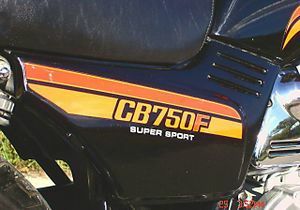 The stripes on the black bike were orange and red; but on the silver bike they were black and blue. 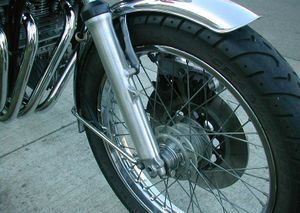 The front disc brakes were slotted with dual piston calipers; the rear had a single disc brake. 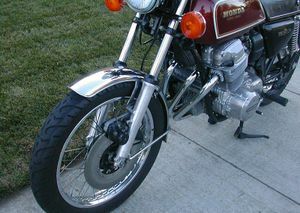 The front fender was redesigned. There was a rear spoiler behind the seat. 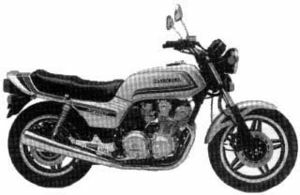 The exhaust was a 4-into-2. 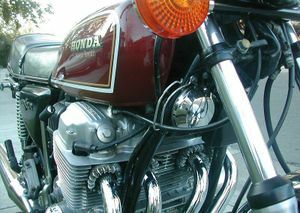 The engine color was black. 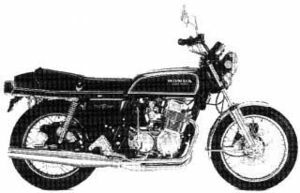 The engine was a 749cc DOHC 4-valve air-cooled inline 4 cylinder linked to a 5-speed transmission. 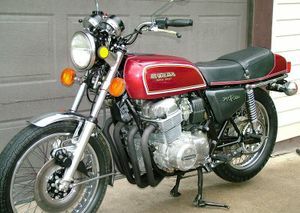 This page was last edited on 28 November 2010, at 20:54.